There has been a dramatic increase in teenage pregnancy in the country making it the highest even among ASEAN countries from 1999 to the present. The issue of teenage pregnancy may be viewed not solely on health outcomes but the overarching issue of positive maternal and child well-being from a population and development perspective. What is lacking in the literature is an analysis of female youth who had ever been pregnant decoupled from the concept of it being unintended. Also lacking especially in the Philippines context is focusing on the women who are at risk of this event. Determining associated characteristics for this event is an apt pre-emptive profile that may help policies. For this study, the 2008 and 2013 National Demographic and Health Survey is utilised. Several factors are considered as independent variables that may be described as a demographic and behavioral factor, and this set of determinants are tested for both outcomes to show if there are similarities. Results show that being in a union, low education and socioeconomic status; living with parents, access to tri-media, and contraceptive practice are correlated with the outcomes of having been pregnant and the risk of being pregnant. Age at first sexual engagement and residing in the rural area are correlated only to have been pregnant. This may help toward creating programmes that can target particular comportment that will abate the prevalence of such event and subsequently improve maternally and child health. M. VICERRA, Paolo Miguel. 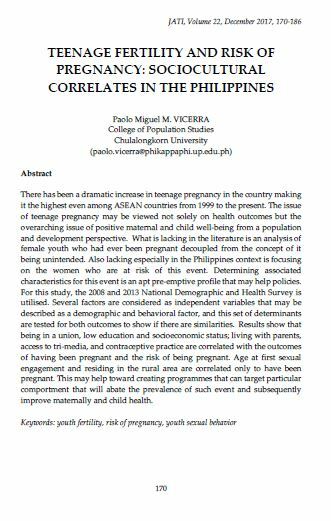 TEENAGE FERTILITY AND RISK OF PREGNANCY: SOCIOCULTURAL CORRELATES IN THE PHILIPPINES. JATI - JOURNAL OF SOUTHEAST ASIAN STUDIES, [S.l. ], v. 22, n. 1, p. 170-186, dec. 2017. ISSN 2600-8653. Available at: <https://jati.um.edu.my/article/view/10253>. Date accessed: 20 apr. 2019. doi: https://doi.org/10.22452/jati.vol22no1.12.